December | 2012 | Could Joseph and Imhotep have been the same person? Joseph (son of Jacob) is a key figure in the Old Testament of the Bible , who became a vizier (sage / viceroy) for an Egyptian pharaoh and during this time was responsible for saving ancient Egypt from a seven year famine. Joseph was able to acquire all the land of Egypt (except that of the priests) by selling grain during the famine. In this way, Joseph made the Pharaohs very rich. Joseph was only 30yrs old when he became vizier and 44yrs old when he had saved Egypt and bought up all the land. He lived to the age of 110yrs and was given a royal Egyptian burial. The Bible is silent about what Joseph did for the last 66yrs of his life although the Bible does say that he was able to not only ensure the survival of his family, he was able to protect them as they grew into a great nation numbering over 2 million at the time of the Exodus (which occurred 430 years after Joseph’s family entered Egypt). The identity Joseph in Egyptian history is debated, but some scholars identify him with Imhotep, who was the vizier during the Third Dynasty under Pharaoh Djoser ( also called Netjerikhet / Zoser). Given Joseph’s position and achievements, one would expect to find some evidence for his existence in Non-Biblical Egyptian records and archaeological discoveries. 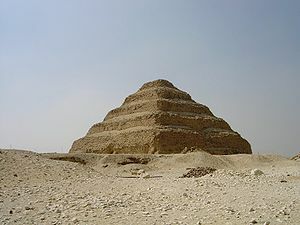 Large pits can be found within the Step Pyramid complex at Saqqara. 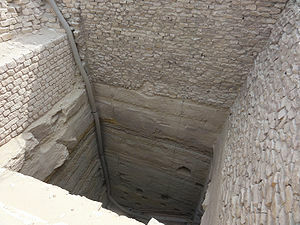 The bottom of the pit can be accessed from an adjacent pit that has stairs. It would have been ideal for storing grain and, most likely, it was used for this purpose. It could have been made by the Hebrew vizier Joseph who had many similarities to the vizier Imhotep who designed the Step Pyramid complex. This has caused many historians to propose that Joseph and Imhotep were the same person. 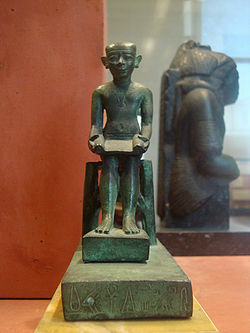 One of three statues of Imhotep in the Louvre. Imhotep and Joseph may be the same person. Egypt was not always united and sometimes there were different rulers in upper and lower Egypt. Sometimes, a conquering Pharaoh would let regional rulers (Nomarchs) stay on as governors when a new dynasty began (eg 12th dynasty). The division of the kingdom into up to 42 ‘nomes’ (regions or provinces) can be dated back to the Old Kingdom and it continued until the Roman period.